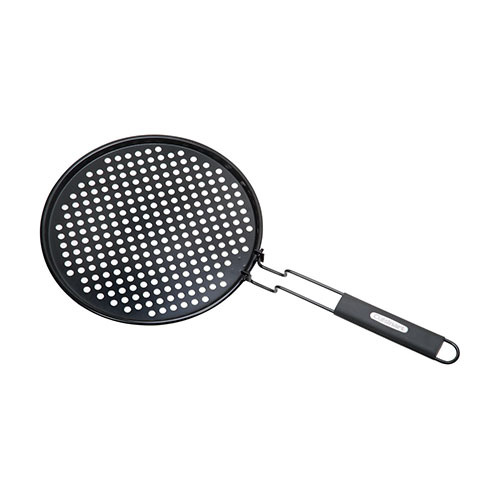 The Cuisinart CNPS-417 is a pizza grilling pan. 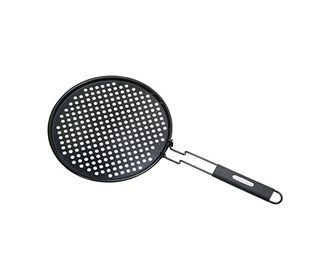 This unique non-stick cookware features perforations to infuse pizza with the natural flavors direct from barbecue. The 12" diameter is perfect for a family and fits most grills. The heat resistant folding handle is also removable for storage and so lids can fully close while grilling. The Cuisinart Pizza Grilling Pan has many exciting features for users of all types. You can extend the lifetime of your Cuisinart Pizza Grilling Pan with the purchase of a FactoryOutletStore Factory Protection Plan. See the Cuisinart Pizza Grilling Pan gallery images above for more product views. The Cuisinart Pizza Grilling Pan is sold as a Brand New Unopened Item.